Most of us love chocolate, whether it’s a little treat during your working day, or indulging in it at Christmas or Easter, we can’t get enough of it! We know it tastes good, but is it doing good? When you buy it does it do something good or help someone somewhere else? If you haven’t heard of them already, let me introduce you to Divine Chocolate! So who and what is Divine Chocolate? The story begins in 1993 in Ghana, when the cocoa farmers co-operative called ‘Kuapa Kokoo’ (which we think means ‘good cocoa growers’ in Twi!) was set up. They’re devoted to running the organisation democratically and producing a very high quality of cocoa, all with the best intresest of the farmers in mind. Then in 1997 they made the brave decision to enter the UK’s chocolate industry, this is when ‘The Day Chocolate Compnay’ launched. The Day Chocolate Companie’s aims are to raise awareness of how much fairer trade is needed in developing countries and growing a market that makes sure cocoa is purchased at the Fairtrade price. They try to raise awareness by supplying us with wonderful, delicious Fairtrade chocolate. So we can all enjoy great chocolate knowing that it’s been produced fairly and is helping others. 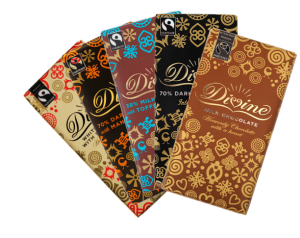 Here at Ethical Superstore we stock many Divine Chocolate products in many wonderful, different flavours of white, milk and dark chocolate. You can get different flavour bars at either 40g or 100g (100g bars pictured to the right). Chose from varying flavours, simple flavours like plain milk chocolate to something a bit more exotic like 70% dark chocolate with mango and coconut. Theres a flavour for everyone to enjoy. Additionally many of their chocolates are suitable for vegetarians. If you’re not fond of chocolate in bar shape then they also do chocolate hearts, chocolate box selections, easter eggs and after dinner thins. If you prefer your chocolate in a complety different form don’t feel left out! Divine also produce tubs of cocoa, drinking chocolate and chocolate bars special for baking. Divine have all of your Fairtrade chocolate needs covered. 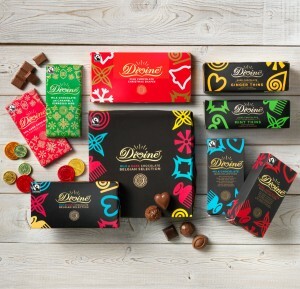 Have you tried Divine Chocolate? Let us know what you think! Previous story Stuck for Ethical Valentine’s Day Gifts? We’ve got you covered.